Which Metal Detector finds Gold Nuggets the Deepest? Home > Which Metal Detector Finds Gold Nuggets the Deepest? There are hundreds of different metal detectors on the market, but only a small percentage of them are good options for finding gold nuggets. To learn more about the specific metal detectors work best in the goldfields, read “The Best Gold Metal Detectors”. There is a small selection of metal detectors that will work best. Many of the gold-specific metal detectors on the market use VLF technology that is really only capable of detecting metal down about a 12” deep or so. Combined with the fact that most gold nuggets are quite small, it makes finding the deep ones especially challenging. Some of the best VLF gold detectors will only find small gold an inch or two deep. Many of the well-known goldfields out there have been mined hard over the years. They have been hit with every kind of metal detector, and the best gold nuggets were long ago found. Because of this, prospectors are always trying to get the best setup to gain every little bit of extra depth out of their metal detector that they can get. 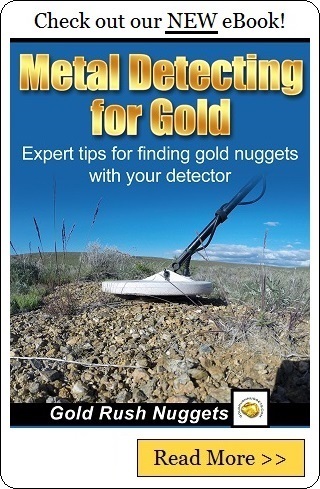 If finding deep gold nuggets is your goal, then you need a Pulse Induction (PI) metal detector. These have been on the market for about 20 years now, with new models coming out every few years that are a modest improvement over the earlier models. The most popular metal detectors for finding those deep gold nuggets are made by Minelab. The earlier versions were the SD2100, SD2200, GP Extreme, GP3000, GP3500 and GPX4000. These detectors are all very capable of finding gold at great depths. A nice sized nugget can be found deeper than 2 feet under the right conditions. The newer models that have come out are the GPX4500, GPX5000. These handle ground noise better than the earlier models, and are really great metal detectors. Most recently, Minelab has come out with the GPZ7000. This detectors uses an all new technology from the previous Minelab detectors, and will find even smaller gold nuggets at better depth. There are some other PI metal detectors out there that will find deep gold nugget. The White’s TDI and Garrett ATX are also very capable detectors that will punch deep. The proper metal detector is only part of the formula for detecting deeply buried gold nuggets. Using the proper coil also makes a huge difference with how deep targets you will locate. Perhaps one of the best combinations currently for finding the deepest nuggets is a Minelab GPX5000 combined with a large round coil. Some are 20”, 25” or even larger in diameter, and will really punch deep. Of course, there are some downsides of seeking out just the large, deep nuggets. Swinging a detector with a large coil can really wear you out in a day of detecting. The added weight puts extra strain on your back and shoulders. There is also the time that it takes to recover the target. Since most targets that nuggetshooters find area trash, you can easily spend a half-hour or more digging out a trash target. This can wear a person out pretty quick. Many gold prospectors don’t really worry about getting the maximum depth they can out of their detector. When you are only focusing on the large, deep targets, you will undoubtedly miss some of the smaller nuggets.